Looking your best for prom means taking care of every detail of your appearance, including your nails. Whether you want a simple manicure or elaborate nail art, there are many options for healthy, beautiful nails. Be sure to take keep your hands moisturized leading up to the big day, and schedule a salon visit the day of the event if you're planning to have your nails done professionally. To complete your perfect prom look, choose a nail polish color and/or design that will accentuate your skin tone and coordinate with your dress. Click the "More Details" link on any of the slides for additional prom nail ideas and inspiration. For a coordinated look, match the color of your nails to your prom dress and corsage. In general, the best look will be a color that is a shade or two lighter than your dress, especially if you have a dark prom dress. 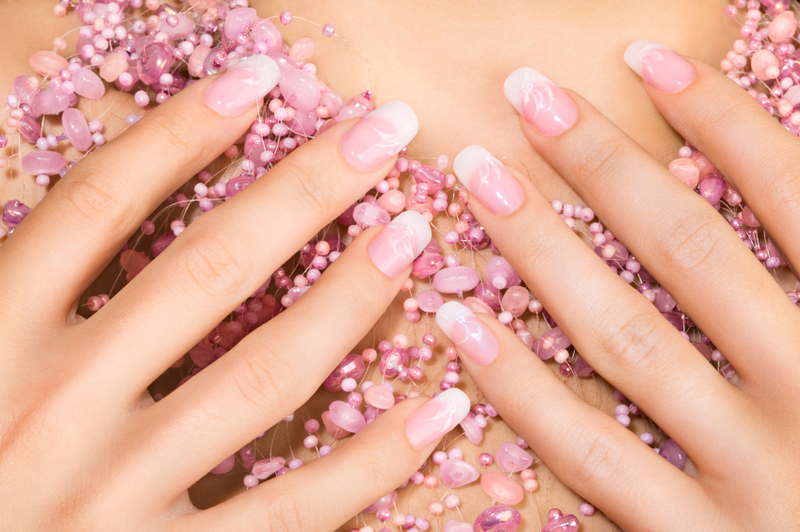 A classic French manicure is a great prom option, no matter what color dress you are wearing. This look can be appropriate even if you don't normally paint your nails, as it adds a subtle, sophisticated shine to your fingertips. If you like the look of a French manicure but want a bolder style, add colored tips to your nails instead of painting your nails a solid color. Coordinate the color with your prom dress for the best results. The classic French manicure is one of the most popular styles for prom nails, but you can add a dramatic flair to the style by choosing gentle curves along the tip of each nail. Adding crystal accents is a popular way to enliven a manicure with a burst of coordinating color. Adding simple flowers to your nails will enhance a pale nail polish with a bit of femininity. Floral designs are especially appropriate if you are choosing a pastel prom dress in a spring shade of pink, yellow, peach, or other gentle colors. A simple crystal accent can be added to a basic French manicure to give your nails a unique design for prom. Flowers, stars, and hearts are the most popular options, and larger crystals can be removed after prom so you can continue to wear the manicure for a longer time. Offset stripes are a unique type of French manicure that add a bit of flirt to your prom nails. Accentuate the curves of the stripes with glitter or crystal accents for even more individuality. Elaborate nail art including abstract designs, geometric patterns, flowers, stars, and other shapes is a popular option for prom nails. Choose a polish with glitter for extra sparkle and flair. Combine several design elements, such as glitter and 3D embellishments over a French manicure to create an interesting look that is as unique as your personality. This is a great way to let your unique spirit shine thorough at prom. For an attention-getting, shiny glow, go for metallic fingernails in a tone that complements your prom dress and accessories. You can choose a shade similar to your dress that has a bit of metallic flair, or go for a true gold or silver hue for a lovely contrast. Bold nail art designs with swirls, multiple colors, glitter, and coordinated accents can be fun to wear for prom. This nail look works especially well if your dress has several colors or you have chosen contrasting jewelry and accessories. Dramatic nail patterns in dark colors and nails with sharp, pointed tips are usually too outrageous for a prom look unless you plan to wear a goth prom dress or the dance is heavily themed. This can still be a fun look, however, if you are comfortable with such a bold statement. There is no reason that all of your nails have to look the same. If you're wearing a solid color dress, introduce some pattern into your look with carefully placed hand-painted designs or carefully selected nail art embellishments on a few of your nails. What a great way to showcase your individuality! To make your nails stand out, coordinate the nail polish color and any designs with the other makeup you will wear on prom night. This will give you a beautiful, finished look for your entire ensemble. If you're worried about the color chipping before the end of the night, consider a gel manicure for a long lasting, vibrant shade. For a fun prom look, consider theming your nails after the school's mascot or the prom theme. Tiger stripes, paw prints, lightning bolts, and school colors are popular options for nails with school spirit, while gold Hollywood stars, the Eiffel Tower, and flowers are easy designs for many common prom themes. If you plan on wearing strappy sandals or peek-a-boo toe shoes with your prom dress, don't forget your toenails. Coordinating your dress and shoe color with your fingernails and toenails adds a fun touch and completes your look.